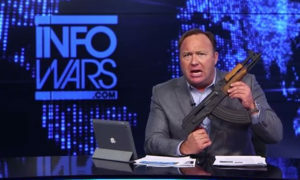 On August 6, a number of giant online media companies, including Facebook, YouTube, Apple, Spotify and Pinterest, took the seemingly coordinated decision to remove all content from Alex Jones and his media outlet Infowars from their platforms. Alex Jones: First they came for the conspiracy theorists…. Lefties defending Alex Jones right now: I hear you, on the surface it appears to set bad precedent to give massive corporations control over who’s silenced. But if you aren’t performing hate speech, libel or slander on a regular basis, then I don’t know what you’re worried about. 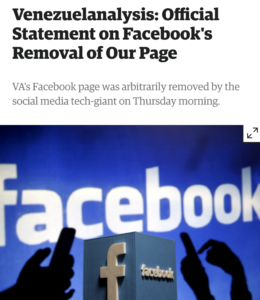 Unfortunately, Facebook immediately used this new precedent to switch its sights on the left, temporarily shutting down the Occupy London page and deleting the anti-fascist No Unite the Right account (Tech Crunch, 8/1/18). Furthermore, on August 9, the independent, reader-supported news website Venezuelanalysis had its page suspended without warning. The site does not feign neutrality, offering news and views about Venezuela from a strongly left-wing perspective. But it’s not uncritical of the Venezuelan government, either, and provides a crucial English-language resource for academics and interested parties on all sides wishing to understand events inside Venezuela from a leftist perspective, something almost completely absent in corporate media, which has been actively undermining elections (FAIR.org,5/23/18) and openly calling for military intervention or a coup in the country (FAIR.org, 5/16/18). My latest book, Bad News From Venezuela: Twenty Years of Fake News and Misreporting, detailed the complete lack of diversity, and the strict adherence to an anti-Chavista editorial line, across corporate media. Venezuelanalysis, praised by the likes of Noam Chomsky, Tariq Ali and John Pilger, offers an alternative perspective. The abrupt nature of its de-platforming is a worrying development for alternative media. Following an appeal and a public outcry on social media, Venezuelanalysis was reinstated on Facebook. However, the social media site offered no explanation for what happened. Facebook recently announced it had partnered with the Atlantic Council in an effort to combat “fake news” on its platform (FAIR.org, 5/21/18). An offshoot of NATO, the Council’s board of directors is a who’s who of neo-conservative hawks, including Condoleezza Rice, Colin Powell, Henry Kissinger and James Baker; CIA directors like Robert Gates, Leon Panetta and Michael Hayden; retired generals like Wesley Clark and David Petraeus; as well as senior tech executives. Forty-five percent of Americans get their news from Facebook. When an organization like the Atlantic Council decides what news we see and do not see, that is tantamount to state censorship. Venezuelanalysis (8/9/18) had its page temporarily removed from Facebook. Venezuelanalysis (12/13/17) exposed that the Council was working closely with the Venezuelan opposition, donating over $1 million to it, part of a wide-ranging effort at regime change against multiple progressive governments in the region (Brasilwire, 12/28/17). That Facebook censored a news site responsible for investigating its partner is a worrying development in journalism. Venezuelanalysis’ statement (8/9/18) on its removal noted that “Facebookappears to be targeting independent or left-wing sites in the wake of Russiagate.” As I previously argued (FAIR.org, 7/27/18), the utility of the Russian “fake news” scandal is that it allows corporate media to tighten their grip over the means of communication. Under the guise of combating fake news, media organizations like Google, Bing, Facebook and YouTubehave changed their algorithms. The effect has been to hammer progressive media outlets. AlterNet’s Google traffic fell by 63 percent, Media Mattersby 42 percent, TruthOut by 25 percent and The Intercept by 19 percent (WSWS, 8/2/17). Sites like these that challenge corporate perspectives are being starved of traffic and advertising revenue. Facebook’s claim to be concerned about the spread of hate speech if it weren’t meeting with the far-right to coach them on how to use the social media platform for recruitment and micro-targeting (Bloomberg Businessweek, 9/29/17). 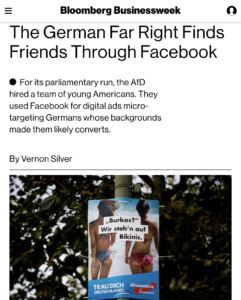 That Facebook’s stated concern about stopping the spread of hate speech is genuine is challenged by the fact that the far-right Alternative fur Deutschland (AfD) party went to Facebook headquarters in Berlin in 2017 to discuss how it could use the platform for recruitment and for micro-targeting in the German elections, as Bloomberg Businessweek (9/29/17) reported. Through Facebook and with the help of American companies, AfD nearly tripled its previous vote share, becoming the third-largest party in Germany, the far right’s best showing since World War II. The Russian fake news scandal has provided enormous media monopolies an avenue to try to reassert control over the means of communication. This latest action by Facebook is part of a worrying trend towards greater censorship of media. It is unlikely it will end here. Progressives should not necessarily shed tears for Jones, but they should be aware that their media is next in line, and that Jones’ deplatforming sets a dangerous precedent that is already being used against them. If I had a Facebook site I would cancel it. Facebook, Youtube, et al have been targeting the excellent Jimmy Dore portal as well..